Born & Raised in B.C. Cindy took a serious interest in Art in high school. Her formal training began at the Alberta College of Art in Calgary where she received a Travel Scholarship to travel to the Canadian Maritimes and completed her studies with a B.F.A. from the Nova Scotia College of Art & Design in 1982. 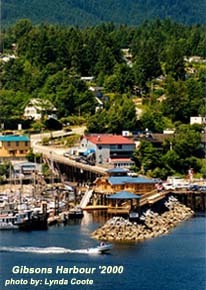 Cindy's first visit to scenic Gibsons Landing on the Sunshine Coast in June of 1984, resulted in her moving there a week later. Immediately, she opened a picture framing store which quickly evolved into a local Art Gallery featuring many of the high caliber local artists of the area. During the dozen years as a gallery owner, she worked hard to organize various group exhibits and displays, she also hosted Art Workshops, Co-Hosted 3 Art Videos, and began developing Artist Studio Tours. 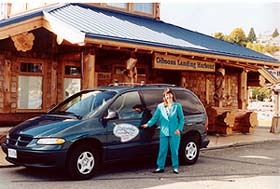 Over the course of almost two decades Cindy has been pro-actively involved in the local community being a founding member of; the Gibsons Landing Business Association, the Gibsons Heritage Society, the Gibsons Landing Co-op Gallery. While a Director on the Chamber of Commerce she instigated and ran the Travel Ambassador program on BC Ferries for the first four years (1997 to 2000). She has also been active with the Coast Cultural Alliance and the Arts & Cultural Accord as well as local tourism organizations. In 1998, Cindy established Artworks Tours specializing in Personally Guided - Arts & Cultural Day Trips to Artist Studios and interesting places of the Sunshine Coast. Tours include a visit to meet artists demonstrating works of art in progress; from painting to pottery to sculpture or other artforms. Art Tours can adapted to the specific interests and time constraints of each group. Cindy is also happy to assist or arrange workshops for small groups of 4 to 20 people. Starting originally as a Step-on-Guide for groups coming to the Sunshine Coast, Cindy is now a Receptive Tour Planner inviting groups to visit. Recently Cindy has established Artworks Creative Journeys to develop combined Nature and Arts & Cultural Packages for the convenience of visitors wishing to Discover many of the Hidden Features of the Sunshine Coast. Packages include guided Arts & Cultural or Outdoor Activities, meals, accommodations, transportation, as well as special interpreted programs and general sightseeing. All Programs are customizable and could dovetail nicely into any one of the local festivals and events any where along the Arts & Cultural Highway Route. Artworks provides unique Art Tours and Cultural Gateway to the Sunshine Coast. Whether planning a day trip or overnight excursion I will personally guide you. Your group can relax in good hands as we visit Artists Studios, Art Galleries and Museums. I customize the itinerary to your groups area of interest, book delicious lunches, as well as offer local commentary of our scenic area. The Sunshine Coast is just a forty-five minute ferry ride from Horseshoe Bay and one hour from Downtown Vancouver, yet visitors feel as if they are hundreds of miles away as they step into this beautiful, natural landscape. Over 1000 visual & performance artists have chosen this haven to work and thrive. The Sunshine Coast is a Mecca of Artists; painters, printmakers, potters, sculptors, fabric artists, woodworkers, and more. Many Galleries & Shops offer diverse selections & displays of high caliber local artists. All tours include visits to Artists home based studios where demonstrations will be given to show how works of art are created. Artworks is committed to raising the profile of numerous high caliber local Artists by bringing visitors to the Sunshine Coast for leisure learning Arts & Cultural Excursions. Much of the artwork is for sale and many treasures are yet to be discovered. Discover Gibsons Landing's recently restored heritage harbour and surrounding sights. The best way to explore is on foot, with time to browse and take in the leisurely local atmosphere. Your guide provides interesting local lore and shows you all the hidden highlights in historic Gibsons Landing, including galleries, viewpoints, and more. ~ The Cost is $15.00 p.p. for Adults or $10.00 p.p. for Seniors and Youth. Lunch is not included. Get to know three major Sunshine Coast Communities, each with it's unique local atmosphere. Gibsons Landing is home to artists and crafters inspired by the town's mountain to ocean scenery... Roberts Creek - which bills itself as the Heart of the Gumboot Nation - has an appealing funkiness that attracts all kinds of creative people... Sechelt offers picturesque seaside charm, and home of the annual festival of the Written Arts each August.. You'll tour studios and galleries with lunch (included) en route. ~ The Cost is $55.00 p.p. for Adults or $50.00 p.p. for Seniors and Youth. Lunch is included.